Garrett Neese/Daily Mining Gazette Attorneys Paul Novak, left, and Mark Bernstein speak to the Houghton County Board Tuesday regarding a mass action suit against opioid manufacturers. The Houghton County Board said it would take action on the proposal next month. HOUGHTON — Houghton County officials are considering joining other Michigan municipalities in a suit against pharmaceutical companies responsible for manufacturing the opioids brought into the county. 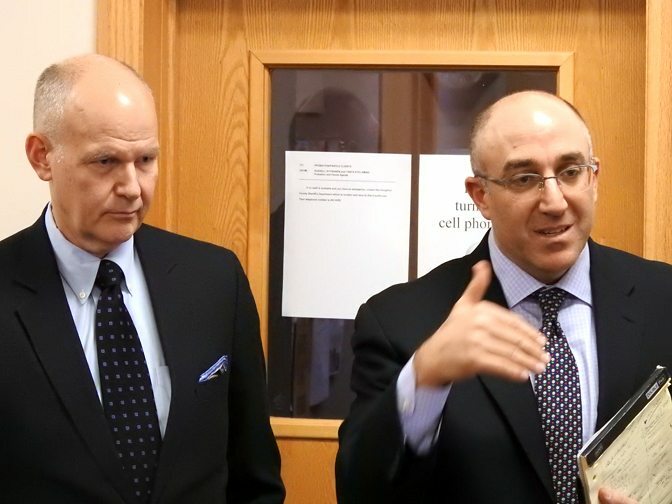 Attorneys Mark Bernstein of the Sam Bernstein Law Firm of Farmington Hills and Paul Novak of the Detroit office of Weitz & Luxenberg addressed the County Board Tuesday on the issue. The suit would seek monetary compensation for the damage done to the county, Bernstein said. But it would also demand the court order the companies to add practices that will limit the diversion and misuse of the product and how they are marketed. While the drugs are valuable treatments, they’re only meant to be used in narrow circumstances, Bernstein said, such as pain management, oncological care and immediate post-discharge care. In Houghton County, there have been 80 prescriptions for every 100 men, women and children a year, Novak said. “There have been significant increases not only in the number of deaths attributable to opioid overdoses but an increase in prescribing conduct and a whole array of the costs that come with addiction to opioids,” such as additional law enforcement responses to emergencies or substance abuse treatment costs, Novak said. “All of these expenses are the types of things that…we’re attempting to collect on behalf of those local governments and their taxpayers so the costs of this epidemic are borne by the manufacturers and the wholesalers and the distributors, not the taxpayers,” he said. The county would get 70 percent of the settlement. The law firms, which would advance the cost of the suit, would get the other 30 percent. Other U.P. municipalities, such as Baraga, Chippewa, Delta and Dickinson counties, Iron Mountain and Escanaba have also joined the suit. Novak and Bernstein represent about 30 municipalities and expect to get another 10 to 20. Nationwide, there are up to 500 cases, he said. In addition to solutions through the justice system, Bernstein said, action should also be taken through tighter regulations and additional laws to prevent diversion and misuse. The pressure of the suits may already be having an effect, Bernstein said. Purdue Pharma, the largest manufacturer of oxycodone in the country, announced last week it would no longer send sales representatives into physicians’ offices to promote prescribing the drug. The suit is a “mass-action” case rather than a class action, meaning Houghton County’s case will still be settled separately, Bernstein said. A federal judicial panel certified the multi-district litigation in November and chose a federal judge in Cleveland to adjudicate the case. Those cases will have “an enormous judicial economy of scale,” he said. Houghton County will share in the discovery process along with the other plaintiffs. A plaintiff executive committee, including Bernstein and Novak’s firms, will represent the municipalities in court. Near the end of the year, the judge will select about a half-dozen bellwether cases, representing a range of states and population sizes. Those cases will help determine possible monetary damages for similar communities represented in the suit. Bernstein said it would likely take 25 to 35 hours of municipal time to help fill out a plaintiff’s fact sheet to determine the increases in costs locally. That number would be higher if Houghton County were one of the communities selected as a bellwether case, Novak said. Board Chairman Al Koskela, pointing to people who still smoke cigarettes, said he didn’t think the suit would reduce the number of people in jail on drug offenses. He said the suit would “fleece” drug companies, which he worried would increase the price for people using the drugs deliberately. Novak said the companies being sued have already made settlements, with no impact on price. Houghton County tabled a decision on the matter so board members could read the materials the attorneys provided.